A smiling doorman dressed impeccably in bright blue Ritz livery greets you at the entrance as you alight from your car. A friendly doorman welcomes guests. The doorman gently ushers you into the elegant reception room, decorated with stunning Persian carpets, crystal chandeliers, Italian marble floors, the stately millwork of wooden walls, and 18th and 19th century paintings. 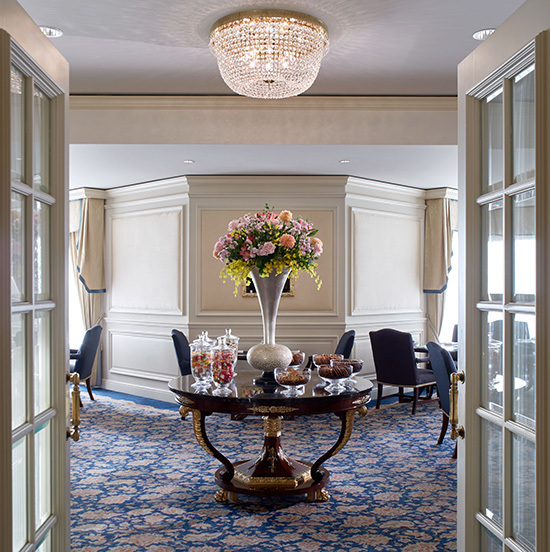 Featuring the look and feel of an 18th century English nobleman’s mansion, the Ritz-Carlton Osaka provides a place of elegance and serenity amidst a bustling historic city. “We pledge to provide the finest personal service and facilities for our guests who will always enjoy a warm, relaxed, yet refined ambience. All of our employees, including the general manager, carry our credo with them at all times. 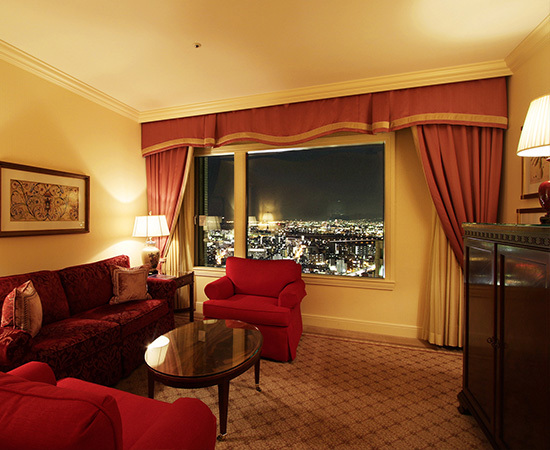 The Ritz-Carlton Osaka offers both familiar comfort and an extraordinary sense of refinement. A close examination of the building’s interior reveals immense dedication to providing superb experiences to every guest. For example, the doors of the main entrance are manual—not automatic, and elevators and escalators are placed far back in the building to maintain the feel of an authentic Georgian mansion. 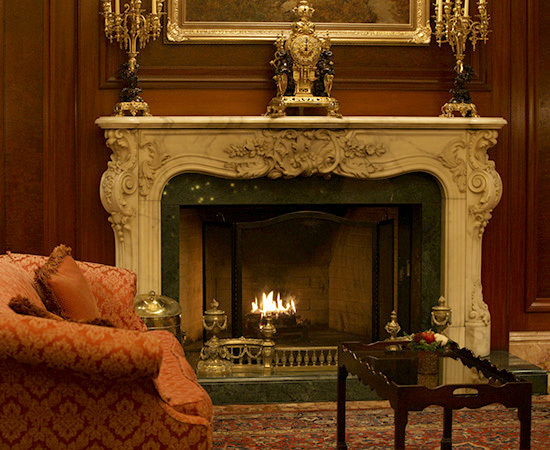 The warm atmosphere of the fireplace-lit lobby. 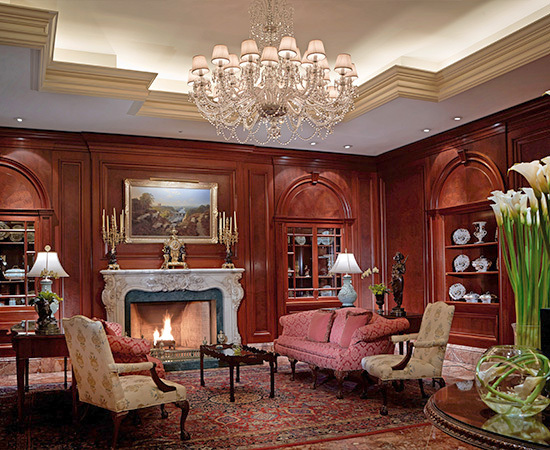 The elegant and luxurious lobby, featuring a collection of 18th and 19th centurie artwork. *Valet parking must be requested in advance. 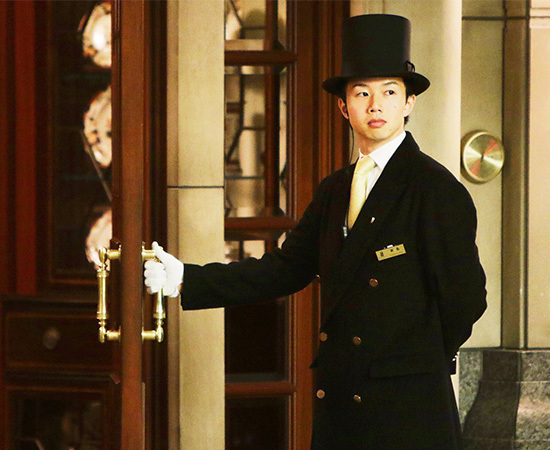 Top photo: A friendly doorman welcomes guests. Center photo: The warm atmosphere of the fireplace-lit lobby. Bottom photo: The elegant and luxurious lobby, featuring a collection of artwork from the 18th and 19th centuries. All employees carry a copy of our credo. 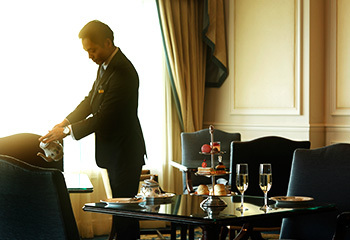 We at the Ritz-Carlton are responsive to the expressed and unexpressed wishes and needs of our guests. We do everything in our power to fulfill the words in our credo. We strive to be constantly aware of guest preferences, concerns, and subtleties of mood to provide service that feels as personal as possible. There are many stories of exceptional service that have reached legendary status. For example, when a guest casually mentioned that oranges were their favorite food during a short conversation with a staff member, they found oranges placed in their room on their next visit. Should a guest request low-irritant pillows, those pillows are provided as a matter of course at every Ritz-Carlton in the world. 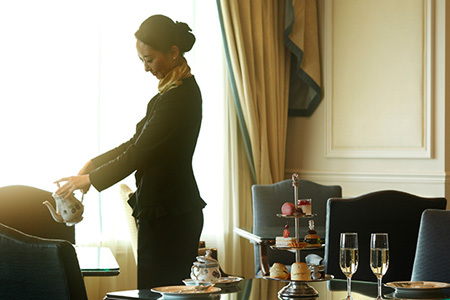 There are endless moving stories by guests who have been touched by the above-and-beyond service of Ritz-Carlton. One guest recalls how they forgot their reading glasses in their room, and a concerned housekeeper personally delivered them from Osaka to Tokyo the next day. Another guest tells how a staff member personally searched for contact lenses they had lost in the pool. A housekeeper taking off work to deliver a forgotten item, or searching for seemingly impossible to find contact lenses, shows our incredibly high standard of service. At the Ritz-Carlton we prioritize the interests of our guests and make it possible for staff to deliver hospitality far beyond the ordinary. Club Floors are only accessible with a Club Floor key. These exclusive corridors, located on the 33rd to 35th floors, feature separate private lounges. Club Lounge food menu. Photo depicts Evening Hors d’Oeuvres. Beautiful seasonal floral arrangements greet guests at the lounge entrance. Soft afternoon sunlight streams into the elegant lounge. 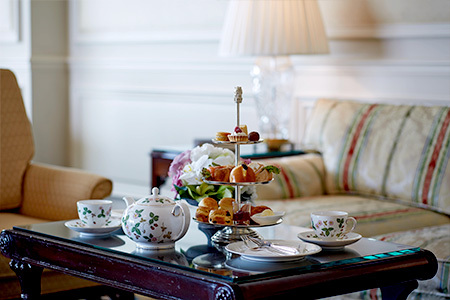 Sink into a cushy sofa after a smooth check-in and enjoy a relaxing afternoon tea with seven varieties of tea, sandwiches, cakes, and other delicacies before retiring to your room. 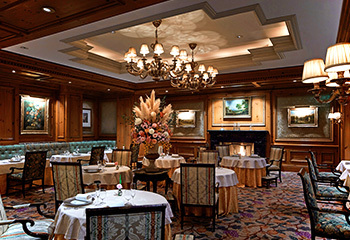 The menu in the Club Lounge changes five times a day, offering Breakfast, Light Lunch, Afternoon Tea, Evening Hors d’Oeuvres, and Night Cap menus. 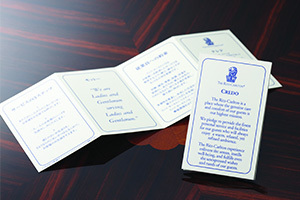 These menus are arranged for guests to feel at ease all hours of the day. The lounge is a great place to interact with the hotel staff. A concierge is stationed on the floors for assistance as well as conversation. If a guest is alone and wants to chat, the concierge is happy to oblige—and is at all times polite and professional. This polite conversation charms our guests, and before they know it, they are often mirroring the refined manner of the service they receive. Bottom photo: Beautiful seasonal floral arrangements greet guests at the lounge entrance. 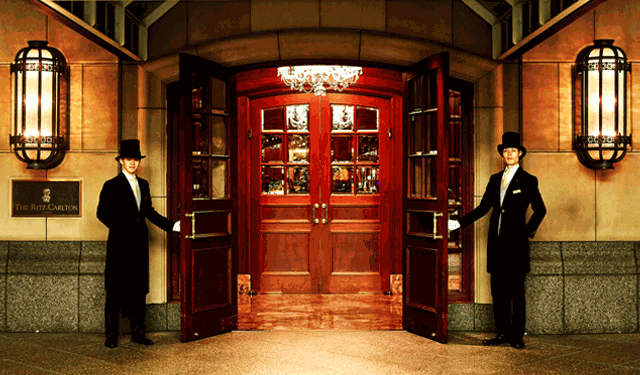 Our club concierge service is there to anticipate your needs. Even among the members of our global hotel group, the Ritz-Carlton stands apart in faithfully preserving the philosophy and traditions of the Ritz-Carlton Hotel Company. Our guest rooms are a symbol of this concept, with the 18th century Georgian-style interiors creating “a residence fit for nobility.” Every detail in the room has been carefully crafted—from the tableware to the ASPREY bath amenities, the same used by the British royal family. 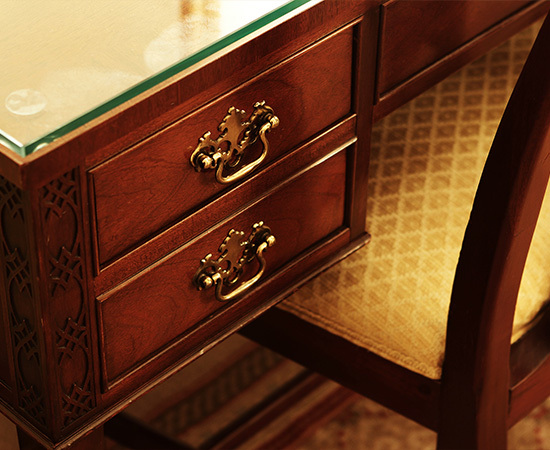 The high-class design and carefully selected items effuse a feeling of affluence and luxury. Meticulous mindfulness is ubiquitous in our guest rooms. All suites at the Ritz-Carlton have two or more separate rooms and the bedroom and living room are divided by a lockable door. 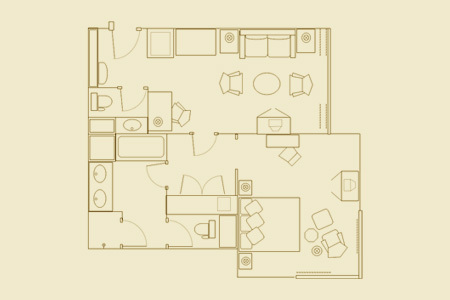 Spaces are clearly demarcated into public (living room) and private (bedroom). Great consideration has been taken to provide a degree of separation between public and private, even among family and intimate friends. Most of the fixtures and furniture are original to when the hotel opened. They are maintained and kept in immaculate condition. Even the teacups are superior items selected with the utmost care. The furniture, fixtures, and appliances in the room are immaculately kept. A full-time engineering staff keeps a watchful eye on hotel operations, striving to maintain flawless beauty at all times. Our engineers include experts in furniture crafts, plumbing, and lighting to ensure expert care in all areas. We continuously seek opportunities to innovate and improve guests' experiences. Ritz-Carlton hospitality includes considering details of which most guests may never be aware, but which have led many to consider our hotel as a second home. Center photo: Most of the fixtures and furniture are original to when the hotel opened. They are maintained and kept in immaculate condition. Bottom photo: Even the teacups are superior items selected with the utmost care. 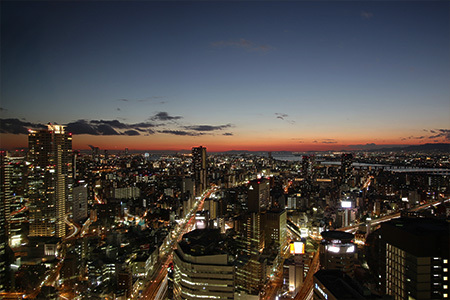 Stunning view of Osaka's skyscape from the window. 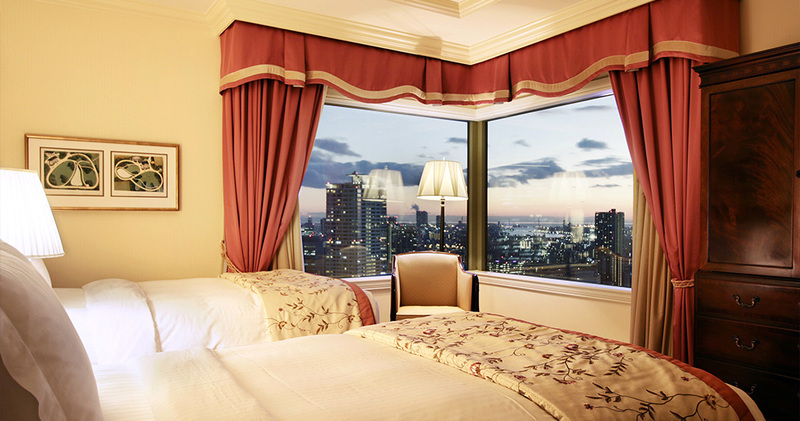 Corner: A suite with separate bedroom and living room, featuring stunning night views. Guests enjoy free access to a fitness center equipped with a variety of exercise equipment, an indoor pool overlooking a courtyard, and indoor and outdoor Jacuzzi baths. 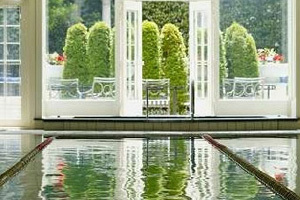 Feel like you are on a retreat at your second home, rejuvenating in comfort. 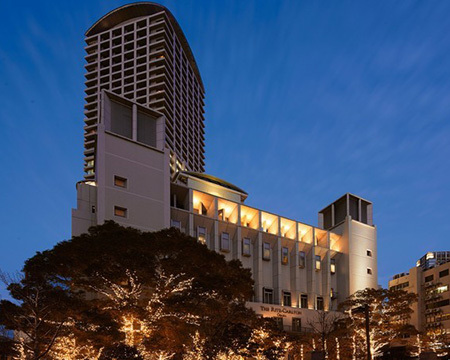 Escape from the tumult of a hectic day and refresh body and mind at the luxurious Ritz-Carlton Osaka Spa. 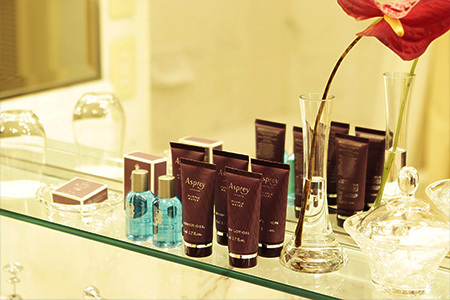 Unwind with treatments from ESPA, utilizing all-natural remedies including high quality plant extracts. Indulge in the moment and let the cares of the day melt away. Please contact the number below for facility hours, pricing, and appointments. ～Restaurants & Bars～ French, Italian, Japanese, Chinese... Six culinary adventures to satisfy your taste buds and your spirit. 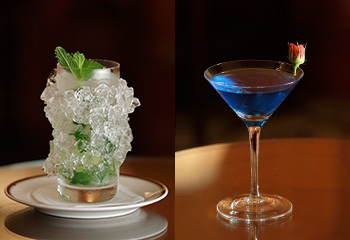 The Ritz-Carlton is home to four restaurants and two bars, all satisfying distinct moods and purposes. 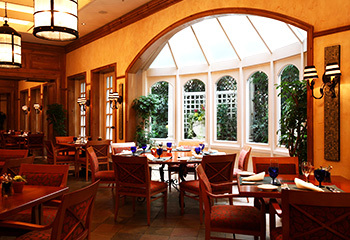 Award-winning French restaurant La Baie occupies the main dining hall. As the name implies, the menu features fresh seafood beautifully prepared using traditional French techniques. 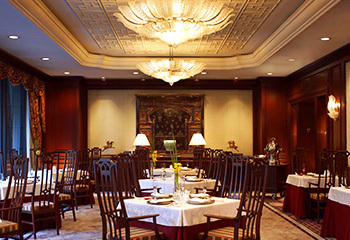 The lush Xiang Tao offers traditional Chinese cuisine featuring many Cantonese specialties. The stylish Splendido serves authentic Neapolitan-style pizza and features a dazzling wine list. 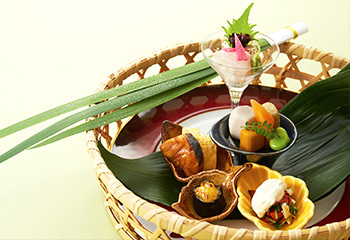 Rounding out your choice of international cuisines is Japanese restaurant Hanagatami, which embodies the rich food culture of Osaka, making creative use of seasonal local ingredients. 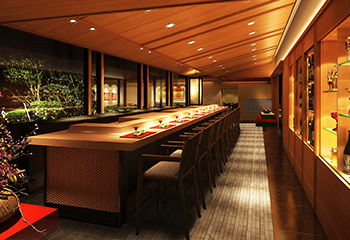 Hanagatami underwent a complete update in March 2016, including the addition of a sushi counter overlooking a hibachi grill and Japanese-style garden. 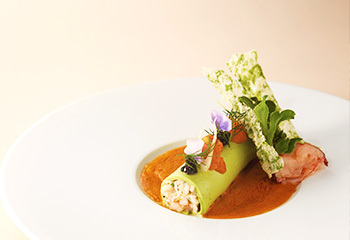 From appetizers to dessert, indulge in the exquisite cuisine of Chef Christophe Gibert at La Baie. The four lunch courses combine seafood, vegetables, and meat in beautiful harmony. 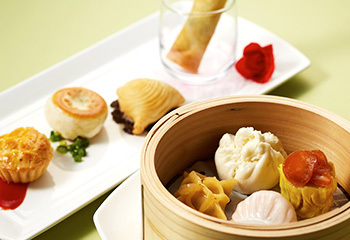 Dine on creative cuisine that fuses modern Chinese with traditional Cantonese cooking. 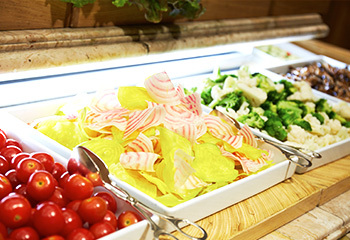 The lunch order buffet features an abundant menu of 51 dishes, offering delights for every palate. Hanagatami had its grand reopening in March 2016. Enjoy the new sushi counter overlooking a hibachi grill and Japanese-style garden! Relax and enjoy authentic Neapolitan style pizza. 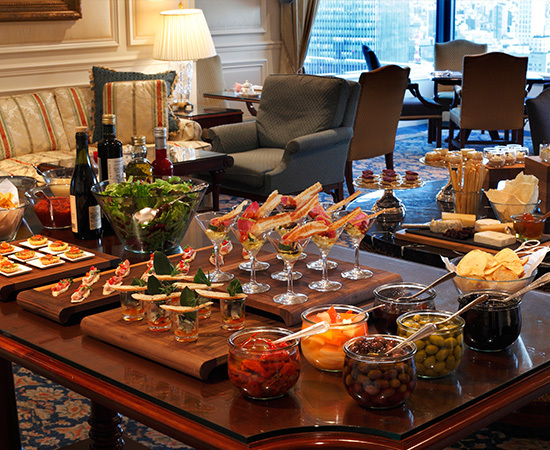 At the lunch buffet, you can enjoy as much authentic Italian dishes as your heart desires. 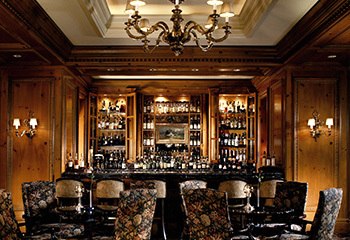 The lounge is the perfect space for a high class evening, offering an extensive drink list, including more than 150 fine malt whiskeys, fresh-fruit Martinis, and 50 types of cigars. The lounge’s European-styled interior creates a truly relaxing atmosphere. 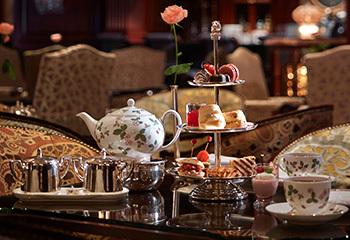 Enjoy an authentic afternoon tea along with live classical music. 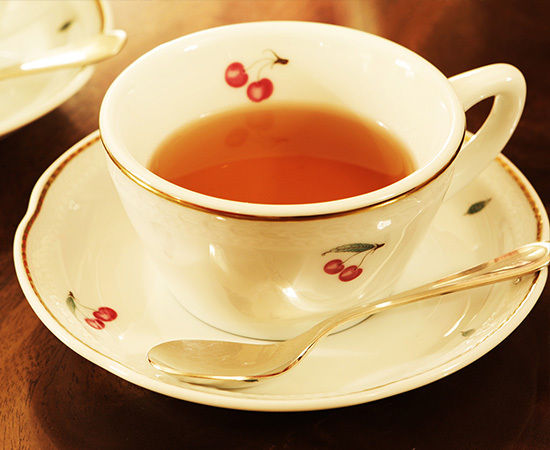 Lunch and tea time menus are current as of March 1st, 2016. Menu prices include taxes and service fees. Information current as of March 1st, 2016.